Happy SUNNY Tuesday from GGH Headquarters in Rhode Island! I was so happy to see the sun peeking through my window this morning. Then I rolled over and realized it was 9:15 am!!! Now most people would be happy about sleeping till 9:15 but not when Zumba starts at 9:30! Sadly I missed class this morning and by the time I made it to the gym class was over and all of my booty shakin buddies were on their way out the door. However, I did see my Angela and she had little something for me from The Official Zumba Goddess-Bernie! How flippin sweet is that?! It’s a reusable Zumba bag!!! I absolutely LOVE it and I can’t wait to use it. With Zachary parked in his section of the gym with Miss Carmen I hit the tready. I have to say I wasn’t feeling my run today, and after I was a mile and half in I realized it was because I kept looking out the window and at the gorgeous SUN!! I should’ve bundled Zac up and hit the park. But I managed to get in a 2 miler, a slow 2 miles, but it was 2 miles. Spring is just around the corner and I couldn’t be happier! My post gym snack was a nice little bowl of Kashi Heart Healthy with sliced banana and Light Vanilla Soy milk. Since it was so nice out, not to warm though, we decided to run errands and walk around Garden City in Cranston. And boy did I get a pleasant surprise!!!!! Chipotle is NOW OPEN!!! I was practically salivating at the thought of my fave Vegetarian Burrito! Plus it doesn’t take much convincing to get the hubby to eat there. I have been waiting for this particular location to open because it’s practically in my backyard! As I skipped to the counter to place my order I was greeted by Paul, and he made my order in record time! Rhode Islanders this is the PERFECT lunch spot! Plenty of parking, tons of tables inside, and when the weather warms up they have an outdoor cafe area set up! AND it’s like 5 minutes away from my gym, Fit World of Cranston, so it also doubles as a great place to stop for some post work out protein!!! Not convinced to jump on the Chipotle bandwagon, I don’t know why not, well here are some HEALTHY and Fun Facts! 1) The company has released a mission statement called Food with Integrity, which highlights its efforts in using organic ingredients, and serves more naturally raised meat than any other restaurant! 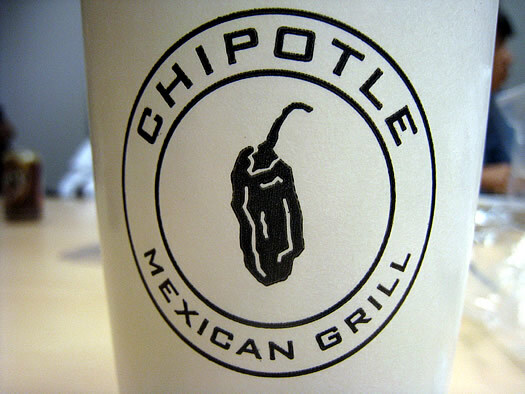 2)Chipotle accepts faxorders, and in 2005 the company added the ability to order online from their website. For both online and fax orders, customers proceed to the front of the line to pay for pre-ordered food. In 2009, Chipotle released an app for the iPhonethat allows users to find nearby Chipotle locations, place an order, and prepay with a credit card. 3)Chipotle has a number of vegetarian options, including rice, black beans, fajita veggies, salsa, guacamole, and cheese, although the pinto beans contain bacon. All items other than the meats, pinto beans, cheese, sour cream, and honey vinaigrette dressing are vegan. The cheese is processed with vegetable-based rennet in order to be suitable for vegetarians, and the sour cream comes from cows that are not treated with bovine somatotropin(rBGH). In October 2009, Chipotle introduced the vegan Garden Blend burrito, containing a plant-based meat alternative marinated in chipotle adobo, at its Dupont Circle restaurant in Washington, D.C.
4)Health.com included the restaurant in its list of the “Healthiest Fast Food Restaurants”. Pretty great huh?! So what does Girl Gone Healthy order?! The Vegetarian, no rice, black beans, guac, mild salsa, peppers,onions, and a smidge of cheese! And because this burrito is so monsterous, it serves as 2 meals!!!! So the next time you’re in Garden City stop by Chipotle and tell ’em Girl Gone Healthy sent ya!! Thanks again Paul!!! To wrap up I want to remind you about the AWESOME giveaway that’s going on right now!! Allright freinds, time to make Zachary some din din and then I think we’ll go for a nice post dinner walk!!! Have a wonderful Tuesday! For just $4 a day you can lose weight, maintain muscle, and get a full days worth of fruits and veggies in 1 shake!!! http://teambeachbody.com/girlgonehealthy click SHOP and take a look at Shakeology! Purevia is far and away my favorite zero calorie sweetener and the travel mug is a nice bonus. Would love to win this PureVia giveaway! Am at GGH twitter follower and a PureVia follower. I need the travel mug to hold my coffee (I have a long daily commute) and Zero calorie PureVia will keep me going without the calories that sugar has.